Baker County is located in the heart of Eastern Oregon and borders Grant County, Malheur County, Union County and the Snake River to the far eastern side. Baker County has a diverse landscape including mountains, high desert and numerous bodies of water. The county stretches over 3,000 square miles and has about 16,000 residents. The communities of the county include Baker City, Durkee, Haines, Halfway, Huntington, Oxbow, Richland, Sumpter and Unity. 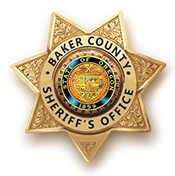 The Sheriff's Office works closely with community and bordering partners including other law enforcement agencies, the Baker County Road Department and the Oregon Department of Transportation in trying to achieve travel and community safety. Working with Integrity, Courage and Protecting the Rights of All is a daily mission for the Deputies of Baker County Sheriff's Office. • Baker County Oregon. All rights reserved. Baker County operates under an EEO policy and complies with Section 504 of the Rehabilitation Act of 1973 and the Americans with Disabilities Act. Assistance is available for individuals with disabilities by calling 541-523-8200 (TTY: 541-523-8201). Read our Liability Statement.